This page provides the online help for gbGallery, which provides an extremely easy-to-use, but very powerful, method of creating a gallery of images, uploading the gallery to your server, and emailing the web page address to your friends so they can view the images! An activation key for gbGallery may be purchased online for $20 using PayPal or a credit card (Visa/Mastercard/AMEX/Discover). gbGallery uses a list of files you provide (a complete folder or selected files from that folder) and creates the pages and image files needed to provide an organized presentation of the images. This typically consists of thumbnails and full-sized images combined into standard web pages which can be viewed by any browser (on your PC or on the Internet). On pages with thumbnails, clicking on a thumbnail will display the full-sized image. gbGallery can read JPG, BMP, and GIF files. gbGallery converts the images to JPG images (both thumbnails and resized images). The original image files files are not changed in any way. You control the sizes of both the thumbnails and images. gbGallery provides many additional settings to help you fine tune your gallery pages. The settings tabs, shown next, are normally hidden but may be displayed at any time by using the menu Options > Additional Settings. The details of the additional settings tabs are discussed in detail later. Here is an image of the main window, expanded to show the settings tabs. gbGallery provides 5 basic gallery formats, as shown in the following thumbnails. You can view the galleries on your PC with your web browser or have gbGallery transfer the files to your web site so that others can view them on the Internet. gbGallery can also email the web address to anyone you choose. A complete email address book capability is provided. When gbGallery is started for the first time the only setting you must make is to select the folder containing the images to be included in the gallery. At that point you can simply press the "Create" button and gbGallery will create a complete gallery of files in a subfolder beneath the selected image folder (you can choose to put the gallery files into any existing folder). The entire set of gbGallery files is contained within a single directory, which has all the files needed to view the gallery of images. Your original image files are left untouched. By default, the output directory is called 'gbgallery' and is created beneath the input folder. gbGallery's default style will create a fully indexed, easy-to-navigate set of gallery files ready for viewing or for upload to your server. Press the "View" button to open the gallery in your default browser. Instructions on how to transfer the files to your server are shown later in this help file. Server information is only needed if you wish to upload the files for viewing on the Internet or if you wish to email the location of the gallery to your friends. gbGallery can also be started from within Windows Explorer. Simple right-mouse-click on the folder containing the images then press SendTo > gbGallery to have gbGallery open up in the selected folder. You can also right-mouse-click on any file and gbGallery will open up in the folder containing the file. gbGallery supports five built-in web page styles, selected from the dropdown control in the first settings tab. All of the styles provide complete, easy-to-navigate galleries. The look and feel of the output may be modified using the many options available from the settings tabs. In general, an index page is created which contains thumbnails of the original images. The thumbnails are linked to additional pages which present a larger version of the image, along with any title or descriptive information you have entered. Some of the styles use a single page format, where multiple thumbnail images are displayed around a central larger image. Selecting a thumbnail displays the larger version of the image on the same page. If the gallery consists of more images than will fit on one page, multiple pages are created, with navigation provided to move from page-to-page. Provides an index page with all thumbnails presented on a single page. Click on a thumbnail to view an individual image page. The image pages have Previous/Index/Next nagivation links. A single page is provided, with all thumbnails shown in a scrollable frame across the top of the page. Click on the thumbnail to see the image details in the frame below. A single page is provided, with all thumbnails shown in a scrollable frame vertically on the left side of the page. Click on the thumbnail to see the image details in the frame to the right of the thumbnails. A single page format is used that presents up to 8 thumbnails - 4 in each of two vertical columns on the sides of the page - with a large image of the selected thnumbnail in the center of the page. If the gallery has more than 8 images, additional pages are created, including navigation links between the pages. A multi-page format. The index page has a thumbnail of every image. Clicking on a thumbnail calls up a popup window that contains the full size image. gbGallery files are placed in the specified local and server folders. Each time a gallery is created the pre-existing files are written over by any new gbGallery files which have the same name. So normally different galleries would be placed in separate folders. In some cases a user might want to have two sets of gallery files in the same folder. The Gallery ID is used to enter a short alphanumberical prefix which will be attached to all gallery file names (images, index page, image pages, and thumbnails). Each prefix will then create a unique set of files which will not be overwritten when another gallery is created, unless the same prefix is used. Directory containing the original images. gbGallery does not make any changes to the original files. Located just to the right of the Image Folder, this shows how many images are in the folder and the current setting for how many are selected for inclusion in the gallery. The default is to include all images withing the image folder. Opens a dialog window that allows selection of the image folder. The image folder may not be typed in. Use of the dialog window ensures that a valid folder is selected. Changes the image folder to the next higher folder. This is provided as a convenient tool for navigation. Re-reads the input folder, discarding any settings/changes made since the folder was last read. This provides a convenient way of reverting to the last-saved set of settings. Shows the name of the output folder. If checked, the selected output folder name will be used. If unchecked, a folder called 'gbgallery' will be created beneath the image folder and used to hold all gallery files. Opens a dialog window that allows selection of the output folder. The output folder may not be typed in. Use of the dialog window ensures that a valid folder is selected. Immediately sends the web page address of the gallery to the current setting of the email To: addres. The gallery files themselves are not sent, only the web address. The recipient of the email can simply double-click on the adddress to open the web page in their browser. Creates the entire gallery - index page, image pages, thumbnails, and resized images. The gallery is created as a subfolder 'gbgallery' under the selected image folder. Views the gallery located on the local PC using the default viewer for HTML pages. Using the built-in FTP capabilities, transfer the gallery files to the specified folder on the server. Views the gallery lcoated on the server using the default viewer for HTML pages. gbGallery's main window cannot be sized, except with this menu option which enlarges the window to show the additional settings tabs. Determines whether the individual image title and descriptions appear on the gallery pages. Determines whether the individual image file names appear on the gallery pages. 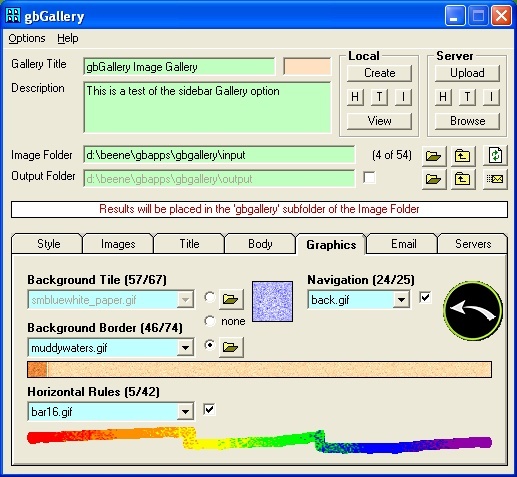 The original design of gbGallery used a standard white backcolor for all of the controls. This setting toggles the use of an alternative colorset that is built into gbGallery. Custom color settings are not supported. The Create button creates HTML pages, thumbnails, and images all at one time. This option exposes 3 additional buttons which allow for the creation of any one of the three groups of files. This allows only the needed files to be updated following changes to the original files or to the gbGallery settings. gbGallery comes with a built-in email client which can immediately send the server URL of the gallery to anyone you choose. This is fast and convenient but you may some users prefer to use the windows default email client in order to access their existing address book. Opens the Image Folder within a standard Windows window. This is provided as a tool to easily access the folder using standard Windows capabilities. Opens the Image Folder within Windows Explorer. This is provided as a tool to easily access the folder using standard Windows capabilities. Opens the Output Folder within a standard Windows window. Depending on your settings, this will be the default 'gbgallery' folder created beneath the image folder or it will be the folder selected in the Output Folder textbox. This is provided as a tool to easily access the folder using standard Windows capabilities. Opens the Output Folder within Windows Explorer. Depending on your settings, this will be the default 'gbgallery' folder created beneath the image folder or it will be the folder selected in the Output Folder textbox. This is provided as a tool to easily access the folder using standard Windows capabilities. This delete the files in the output folder on the PC. It does not delete files on the server. Opens the default browser at the gbGallery Online Help page. Opens a dialog window from which the latest version of gbGallery can be downloaded. gbGallery provides additional categories of settings which an enhance the visual effects of the gallery you create. The settings are split between the following seven tabs. The settings tabs are normally hidden but may be displayed at any time by using the menu Options > Additional Settings. gbGallery provides five basic output formats, examples of which were shown above. Use the Gallery Type dropdown list to select the format to be used. Additionally, the maximum size (in pixels) of the thumbnails and images may be selected. For index pages, the number of thumbnails per line may be set. Finally, the quality (degree of compression) for both thumbnails and re-sized images may be set. Higher numbers use lower compression but give a better quality image. The various gbGallery settings are inserted into the web pages as a CSS style. Users may substitute an external CSS style of their own by selecting it from the dropdown list found in this tab setting. The user-defined CSS file must be placed in the CSS subfolder where gbGallery was installed. By default gbGallery will use all images found in a folder. However by using these options a subset of the images in a folder may be selected for inclusion in the gallery. Additionally, titles for the images (both thumbnails and resized images) may be set. A description for each resized image may also be entered. The position of the images within the gallery may also be set using the up/down arrows beneath the image list. gbGallery also provides the ability to perform some very basic effects, including rotation, on the images. The effects do not take affect until the Save button is pressed. Once Save is pressed the effects are permanent and replace the original file. The dropdown effects list shows the special affects availble. You must press the apply button to see the effect but until the Save button is pressed the effect will not become permanent. The title displayed on all gallery pages may be formatted with the settings on this tab. A sample of the result is shown at the bottom of the tab. The format of the text in the body of the gallery pages may be set using the options in this tab. Additionally various color settings may also be set from this tab. This tab also provides for entry of an optional footnote to be used on the gallery pages. In addition to the thumbnails and resized images, gbGallery provides additional graphic elements for use in the gallery pages. The background (either as a tiled texture or full-width border), horizontal rules, and navigation buttons may be selected by the user. These images are distributed with gbGallery. Users may add their own images by placing the graphics files in the corresponding subfolders of the gbGallery installation folder. This tab provides a simple email address book function. Addresses may be added, deleted, or edited. Pressing the Send Email button sends an email to all selected addresses. The email contains the Internet address (URL) of the gbGallery files. A short message may also be included in the email. If you want to upload your galleries to a server and then email the URL to friends, you'll need to enter the various server settings as shown in the image above. This is the server which will process your outgoing emails. Authentication type (1-PoP3, 2-Auth Login, 3-Auth Plain). Not all servers required pop3 authentication. Check with you service provider to determine the type of authentication required. This is the server where the gallery files are to be uploaded. The name of the server to which the image will be transferred. The folder on the server to which the image will be transferred. The folder must already exists on the server. Tells gbGallery to use passive transfer mode during FTP of the gallery files to the server. Some servers do not allow a URL to contain "public_html" where this is the root directory for a user. Selecting this will cause gbGallery to delete the "public_html" from the URL used to view the HTML pages. gbGallery has been tested on Windows XP and Windows 2000. If you have any problems using it on your system, please let me know.